See how the distance from the board, dart velocity, and arc affect where a dart lands on the board. 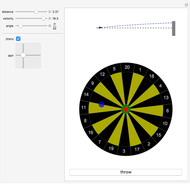 Aim the dart with the blue dot and throw it by clicking the button. The orange disk represents where the dart would land. You can simulate human error by checking the "jitters" box. Its effect decreases with the number of darts you throw.